Each PDF comes with 2 bingo cards and a bonus 3rd blank card for creating your own! Decide the number of players. 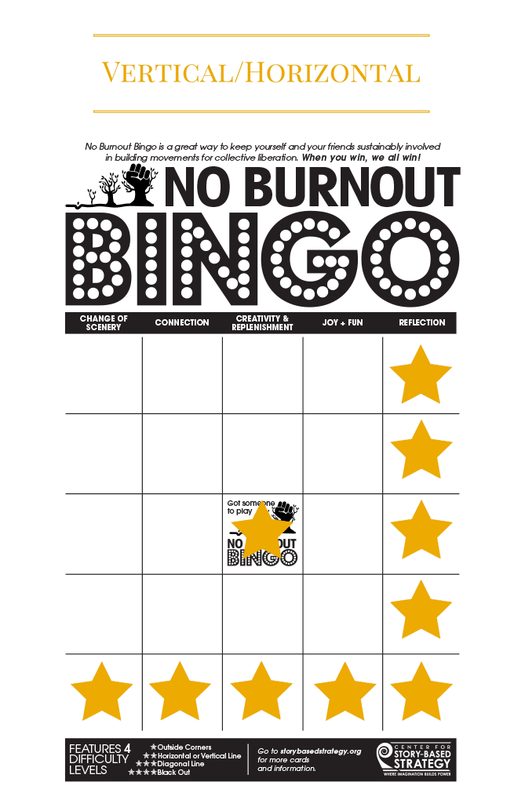 Play No Burnout Bingo alone, or with family/friends/co-workers/network. Each card was made with consideration for ranges in age, experience, and access to activities. Print/Photocopy/Email the bingo sheet making sure that you have enough for each person to play. 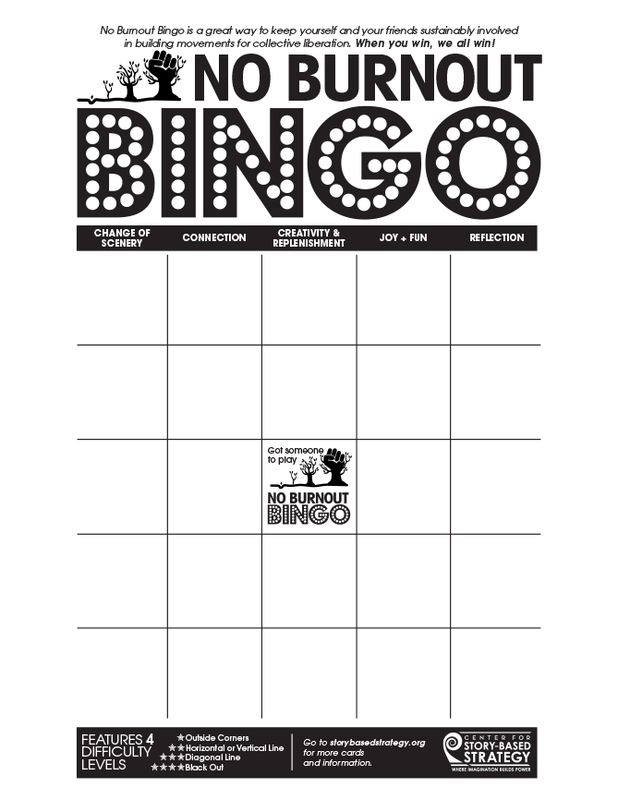 There are 2 different No Burnout Bingo cards in total. Check out all the cards in Spanish next week! Decide which difficulty level you will play. Decide on what the prize will be for the winner(s). Decide how long you will play the game and how you will update each other on your progress. Start your burnout prevention now! When a person successfully gets all of the boxes needed and shouts “No Burnout!”, the game is paused to see if they have indeed won. Check that the player can in some way verify that they indeed can check off that box (some actions may need some explaining and details shared), and then if so, the player with the winning No Burnout Bingo card has won the game. Don’t burn yourself out while playing please. Time to play again with a new card or a new way of playing! Play the game in teams! Challenge another group to play with your team, and see who can get "No Burnout!" first as a group! 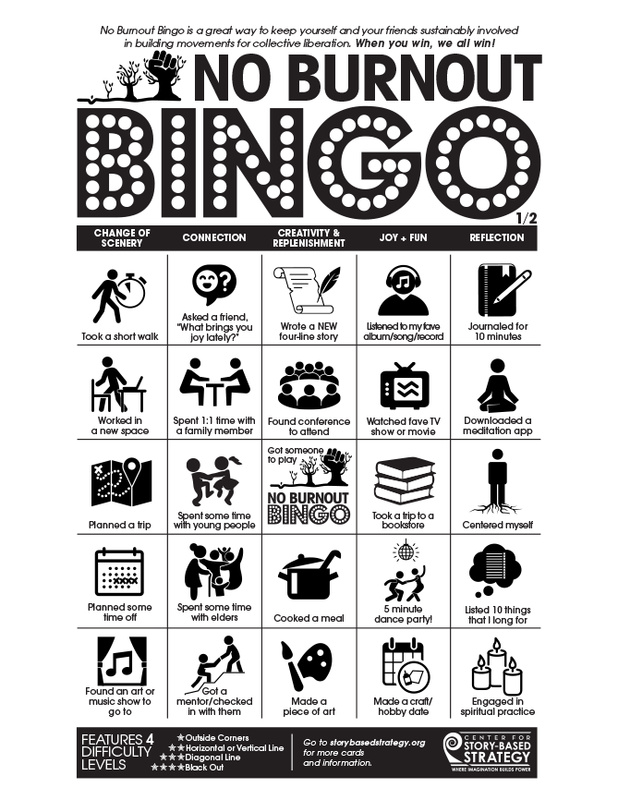 Post progress/photos/videos/inspiration to FB/Twitter/IG with #NoBurnoutBingo to play with others living in different places and/or inspire others and prevent burnout! Use the bingo cards as a “get to know you” activity and gather signatures from individuals in the group to both meet people and see who has what skills and experience in the room.